Tagged under Kazuki Takahashi, Studio Gallop, Card Games, Yu-Gi-Oh (Meta), Series. Mystery, romance, action, fanatsy, humor, ect. This anime has it all, it's very enjoyable and I'm glad this series didn't get aired in the U.S. so it can stay they way it is. The offical card game wasn't released a few years later. If you want to watch this series, unfortunatly you'll have to download it as it hasn't yet been released in America. If you want figure out where to get these episode I'll be happy to tell you so feel free to ask. I love this series because of the unique bond between Mutou Yugi, a short and scrawny high school student, and Pharaoh Atem, an ancient spirit which inhabits the pendant that adorns Yugi's neck. Their relationship goes beyond friendship, brotherly love or even romantic love. They are two sides to one soul, soulmates in the truest sense. It's super anime for me I playing it's game always it's wonderful to watch and I enjoyed a lot with monster battles . And what I like more it's collection it's cards . My favourite monster is blue eyes white dragon just like kaiba . This becomes my favorite when I was a kid, but as I grow old the my interest in watching this starts to fade. But I still play the cards sometimes when my friends wants to play for a change. The first yugioh were Yugi is the primary character is the best.... but when the other new yugioh season appears it becomes complicated. The story became twisted and I totally lost interest in it. Any way I just finished watching the first seoson of Yu-Gi-Oh and it is awesome. This anime caught my attention as it is closely related to the ancient Egyptian civilization. I highly recommend this anime for all lovers of the Japanese animated series. I'm not really into cards (especially Yu-Gi-Oh cards). This anime is mostly about cards and how to get more cards, it tries to make Yu-Gi-Oh (which is supposed to be a fun card game for kids and teens) a somewhat very serious game. I just didn't enjoy this series at all ^^;; The animation and art are very poor, the plot isn't all that interesting as well. I have also read the manga, but it really isn't much better. One thing is good about this series is the monsters are creatively drawn. 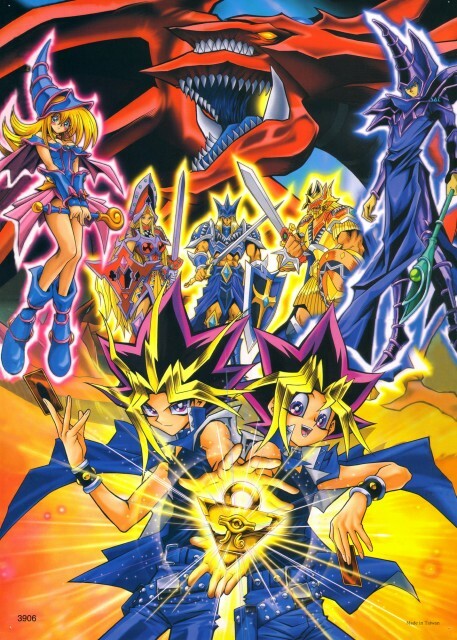 In my Opinion this was the best series in the Yu-Gi-Oh series. It really brings me back to when I was younger and when this show was really cool. The series that came shortly after were just a waste of time. i don't know from where i start, i like this anime very much, it's all seasons are awsome,the main character "yami" is so wonderfull personality,duel monsters game are amazing idea i still play the game and rewatch some episodes, yu gi oh is one of my favorite anime series. charaters so much and of course i like the game, i still playing it with my sisters and brother. This is an alright show, with a bit of a stupid premise, and plot holes that can make you wince if you lend them too much thought. It can be enjoyable, and I know I certainly ran home years ago so I could catch it on television after school, but nowadays the only thing that makes this show bearable is Little Kuriboh and his abridged series. It's repetitive, dragged out, and it's English dub is chuckle worthy. Seriously, how does one go from Katsuya Jounouichi to Joey Wheeler + a Brooklyn accent? Bakura is British? Wait, what? I'm all for sipping cups of tea and high fiving Alan Rickman, but where did that come from? 4Kids, you silly people. This anime is full of lol, exaggeration and on top of that is extremely predictable. The back-story itself is quite attractive but the cards just ruin the mood. The same applies for insane and boring characters that appear throughout the whole series. If it had only 24 episodes then I'd call it 'watchable' but with the amount of eps it has is just a story repeating itself in an endless loop. I liked the movie, but the series was great! This was the only series where card games wasn't boring. The animation and art were nicely done. I liked the monsters more. My favorite one has to be Blue Eyes White Dragon, which is very sad because it is the reincarnation of the Seto Kaiba's lost love. But anyway, the last season was my fave since Egyptian times were awesome back then - so that was a huge plus. I LOVE Yu-Gi-Oh, it has a strong focus on friendship - sticking together no matter what, trusting in both yourself and your friends, and working together. The 4Kids version is really just a load of watered down crap. If you've only seen the 4Kids version, you've never seen the real Yu-Gi-Oh, and I encourage you to give the Japanese version a try. Oh the memories <3 I was probably the only girl in my neibourhood who really loved Yu-Gi-Oh. I can remember running home like crazy at 4:30 so I wouldn't miss my episode ;D So yeah, my kid self thought the show was fantastic.